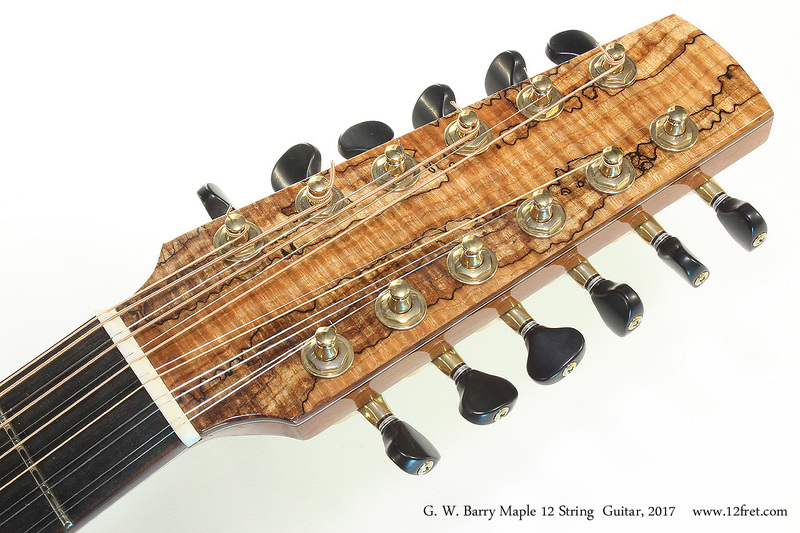 Today we are featuring a recently commissioned piece, a custom maple bodied 12 string, from the workshop of G.W. Barry. Seeking a broader sonic palette to add to his bands sound, this customer approached Mr. Barry to discuss the select features necessary to achieve his twelve string vision. Twelve strings can be a little overwhelming in size and balance so,a twelve fret to body joint and shorter scale was decided upon to create both a less cumbersome instrument and one that would be lush and chimey in tonality. Moving the bridge to a more central position in the lower bout adds mid-range which helps to de-clutter things sonically. The use of Big Leaf figured Maple for the back and sides seems to tame ( in a good way) the top end…while the use of a Bearclaw Sitka top and rosewood bridge plate assures a good amount of overtones. The addition of a soundport not only allows the player better “monitoring” but also adds to the overall tonal spectrum. Cosmetically, a spalted Maple and Abalone rosette are complimented by a matching headstock veneer and floating back-strip detail. Tasmanian tiger myrtle binding frame the highly figured Maple and Bearclaw top. A ‘curvy’ monogram at the 9th fret shows the owners initials. 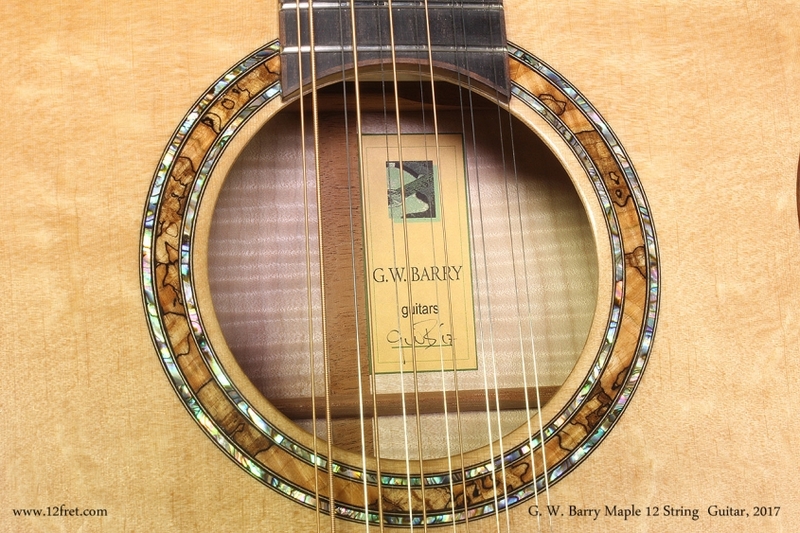 With well over 30 years of experience as a builder of top flight acoustic guitars, G.W. Barry guitars is offering a unique and personalized approach to fine guitars — if it is time for your ‘dream’ guitar — be it however many strings! Serial Number: Built to Order during 2017 at the G W Barry shop in Toronto, Ontario.